Diana release date was Friday, November 1, 2013. This was a Limited in theaters release. The film takes audiences into the private realm of one the world’s most iconic and inescapably public women -- the Princess of Wales, Diana (Naomi Watts) -- in the last two years of her meteoric life. On the occasion of the 16th anniversary of her sudden death, director Oliver Hirschbiegel explores Diana’s final rite of passage: a secret love affair with Pakistani heart surgeon Hasnat Khan, the human complications of which reveal the Princess’s climactic days in a compelling new light. Based on a screenplay by award-winning playwright Stephen Jeffreys, inspired by the book Diana: Her Last Love by Kate Snell, which was in turn drawn from extensive interviews with close friends and confidantes. 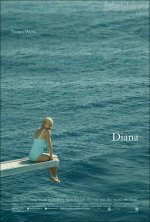 The result is a window into the tumultuous, change-filled period from 1995-1997, in the wake of Diana's shattering divorce from Prince Charles, and at the moment when she stood on the cusp of a different life, evolving into a global humanitarian, a master of maneuvering fame and becoming her own woman.